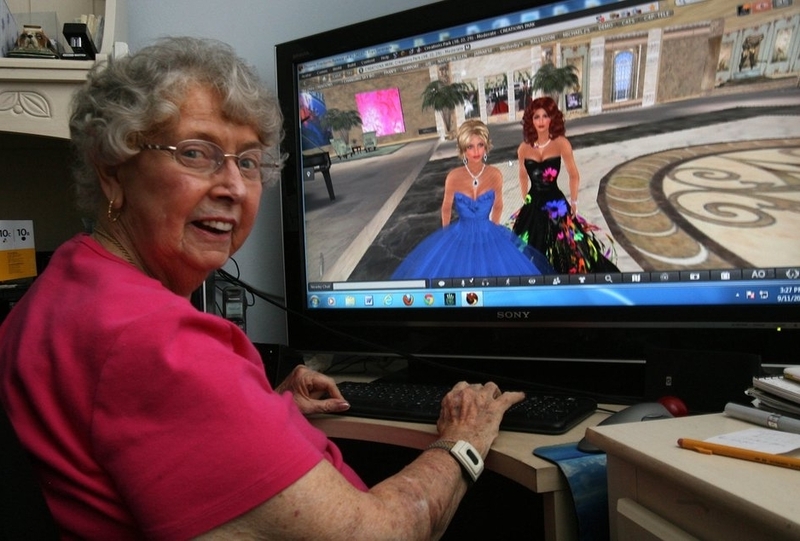 We’re all probably familiar with the story of Fran Swenson, now 86, a Parkinson’s sufferer who has seen something of an overall improvement in her condition which she attributes to Second Life. It’s a remarkable story, initially broken by Hamlet Au in February 2013, which has again demonstrated the therapeutic impact of Second Life which is not always obvious to many of us, and which can itself become the subject of wider study. Now Fran, who is known in-world as Fran Seranade, and her story are again being picked-up by mainstream media as the San Diego Union-Tribune (Fran is a San Diego resident, rl) provides more insight into Fran’s life and that of her family, together with thoughts and feedback from Tom Boellstorff, an anthropology professor at UC Irvine, who took interest in Fran’s situation back at the start of the year, and Donna Davis, a strategic communications professor at the University of Oregon. Pam Kragen, author of the piece, provides a very focused and heart-warming article which not only encompasses Fran’s life and her family, it also does much to overturn the “accepted” view of Second Life so often adopted by those outside of SL. But it’s the underlying benefits which make the real story here, and which have drawn Fran to the attention of Boellstorff and Davis, and now the San Diego U-T. In real life, Fran has reported she feels mentally better as a result of the time she spends engaged in SL; she has seen her physical capabilities and freedom of movement improve, and has felt a corresponding uplift in her overall quality of life. Having lost her husband to Parkinson’s in 2003, Fran found herself diagnosed with the illness the following year. 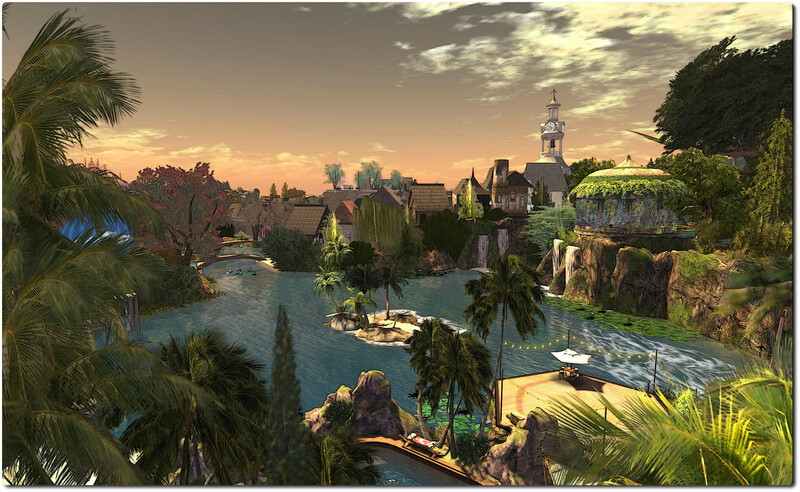 As a result, her son Ken, living on the other side of the country in Florida, proposed the idea of using Second Life as a means of bringing the family together more easily, offering to build a home for them in-world. Fran’s daughter, Barbara Richards, living up the coast from San Diego in Carlsbad, CA, admits to Kragen that, initially, she wasn’t that keen on the idea. Her reasons were perhaps all too familiar to many of us: the steep learning-curve for those not particularly well-versed in the nuances of virtual worlds and / or computer games and environments; the negative image of SL as a sexual playground, and so on. She also admits that she was one of those who tended to point a derisive finger at SL users, “We would make fun of the poor people on Second Life because we didn’t think they had a real life,” she candidly tells Kragen. Like most who gain a decent foothold in SL, Richards was quickly converted to the platform and through it and her avatar, Barbie Alchemi, found her own creative outlet. But it was in witnessing her mother’s response to the platform that gave her the greatest inspiration, to go ahead and build Creations Park, a place where her mother and other Parkinson’s sufferers can spend time, find support and enjoy one another’s company. She and her family have also formed a support group raising funds for Team Fox, the fundraising division of the Michael J. Fox Foundation for Parkinson’s Research. In 2012, the group raised $4,000 for Team Fox. 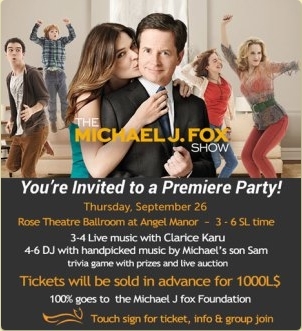 This weekend, as part of a goal to raise $12,000, they’re co-hosting in a further fundraiser at Angel Manor’s Rose Theatre Ballroom to mark the premiere of Michael J. Fox’s new television show (see below for details). Even so, as Kragen reports, it’s still very much an uphill struggle for the Creations for Parkinson’s team, in part – again – because SL does have a stigma attached to it and because the learning-curve in getting to grips with it is so high for many people. Things are further hampered by the fact that there are many in SL who suffer from Parkinson’s and other illnesses who don’t want to talk about their condition or admit to it, because Second Life allows them the freedom to escape their real life limitations and pains. Since starting Creations, Richards has made it – and the $5,000 a year spent on maintaining it – her full-time unpaid job. She believes the improvements her mother has experienced are far from coincidental, and Tom Boellstorff is prone to agree, explaining to Kragen his view that Fran’s improvement might be caused by so-called “mirror neurons“, which cause animals to perform the same action being performed by another (think seeing someone else yawning, only to yawn yourself – that’s a mirror neuron effect). In Fran’s case, Boellstorff believes a mirror neuron effect is in operation as a result of her daily visual stimulus of seeing herself in-world carry out a range of physical activities denied her in real life: Tai Chi, dancing, and so on. 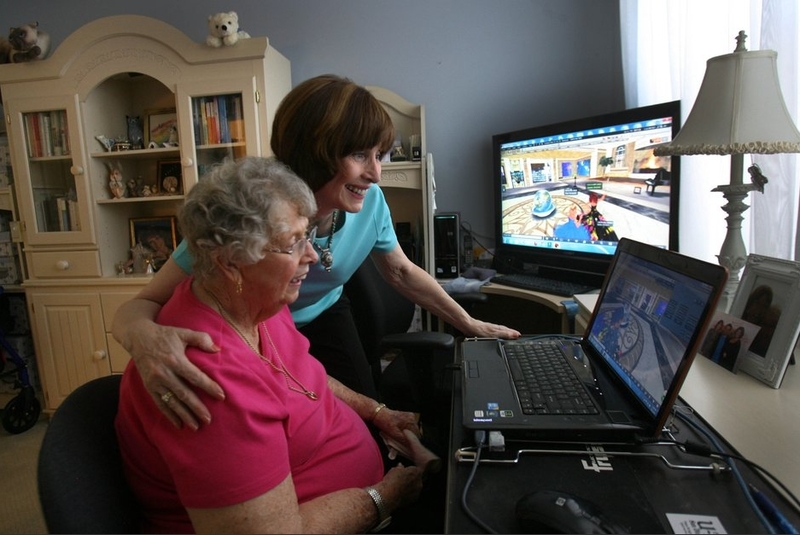 While Fran’s situation hasn’t – as yet – been experienced by other Parkinson’s sufferers in SL, it has been enough to encourage Donna Davis to establish Frantastica alongside the Creations region, where she now hosts the weekly Parkinson’s support group sessions, in hopes of learning more about how the avatars can help patients. Kragen’s article is a fascinating insight into Fran’s situation, her family’s work inside Second Life and a very positive and sympathetic look at the platform as a whole, which also touches on the work of Virtual Ability Inc., and the use of virtual environments in therapy. Michael J. Fox, himself a victim of Parkinson’s disease and founder of the Michael J. Fox Foundation for Parkinson’s Research, makes a return to US television screen this fall (autumn). To mark the event, Team Fox SL and Creations for Parkinson’s are hosting a special VIP Premiere Party at the Rose Theatre Ballroom, Angel Manor, on Thursday September 26th, from 15:00-18:00 SLT. Tickets are L$1,000, and can be purchased from special in-world vendors such as those at Creations Park and Angel Manor. The party will feature a special auction with some pretty amazing items up for grabs – including a video about the highest bidder by the Drax himself! Find out more on the Creations for Parkinson’s website. All income and donations arising from the party will go directly to Team Fox. This story only let me smile, and show what virtual worlds really mean for people. This blog page is so important, that i posted link on other place to here. It let me smile and cry at the same time. It’s funny to find this because I was born and raised in Sunny San Diego and at age 14 (1992), had a sever stroke and brain aneurysm. I can’t run but I love using sl because I can be the me I should be. sl, my name is Zarah Ansar . I have played SL for over 2 years now and it’s been very therapeutical for me. Thank you for the article. Your comnpleet right, thats still how it feels for me to. There are many support groups in Second Life. A variety are hosted on the Dreams Sims such as the Shockproof, AS Discussion and ADHD Support Groups. Dreams hosts monthly building contests, weekly texturing and speed building contests, and seasonal events. The contests are for builders of all levels. It’s a safe place where others are available to help you learn. There is also a sandbox for building or unpacking. Along with the dear friends I have made in Second life, we have been fortunate enough to host the ADHD Support Group 2.0 for over 4 years. Here is a link to the ADHD group information http://world.secondlife.com/group/c1bc7378-4311-b0e0-17d4-91b2f6f74091?lang=en-US. You can look us up on Facebook or find us in -world. Thank you for this uplifting story. I too am handicapped, and my mobility is severely limited. SL, however, offers me the opportunity to do things that I can’t do RL like dance and swim. It also allows me to visit virtual replicas of places, all over the world, that I will never be able to visit RL. I will testify that it is almost impossible to live with a handicap that keeps you stuck indoors and unable to function normally, without suffering from some level of depression. SL has also helped me to conquer that. Thanks, Fran, for your inspiration, and thanks Second Life for giving me a place to be who I really am. Thank you for the recognition! Folks with Parkinson’s disease who are interested in joining us in Second Life and our research at Frantastica, feel free to find me in SL as Tredi Felisimo or contact me via email at dzdavis@uoregon.edu. Quite an amazing story. I daresay being happy helps the brain as well. I love the size of her screen…lol. fiction meets reality it is really interesting that we can contribute a little to this great foundation, and congratulations to Barbie and his team for this great work. I’m coming late to this article, but I just met Fran and Barbi inworld and am reading links to various pertinent articles about Second Life. I just have to say I’m tired of SL being reduced in the media to “a haven for sexual and violent fantasy role-playing.” Plug in Movies “are a haven for sexual and violent fantasy role-playing” or America “is a haven for sexual and violent fantasy role-playing” and you see both truth and absurdity.